Enjoy a mini-cruise tour to the sacred island of Delos and discover one of the most important archaeological sites in Greece. An island with a 3,000 year old history, it was once a very important religious and political center in ancient times. Today it is a UNESCO World Heritage Site and the whole island is a dedicated archaeological site. Legend says that the god of light, Apollo and his sister, the goddess of the hunt, Artemis were born on the island giving it sacred status. As a result no mortal was allowed to be born on the island and no one to die on it. Women on the brink of childbirth and people who were ill would be transported to the neighboring island of Rineia. The whole world at the time was aware of Delos, its unique standing and sacred powers. 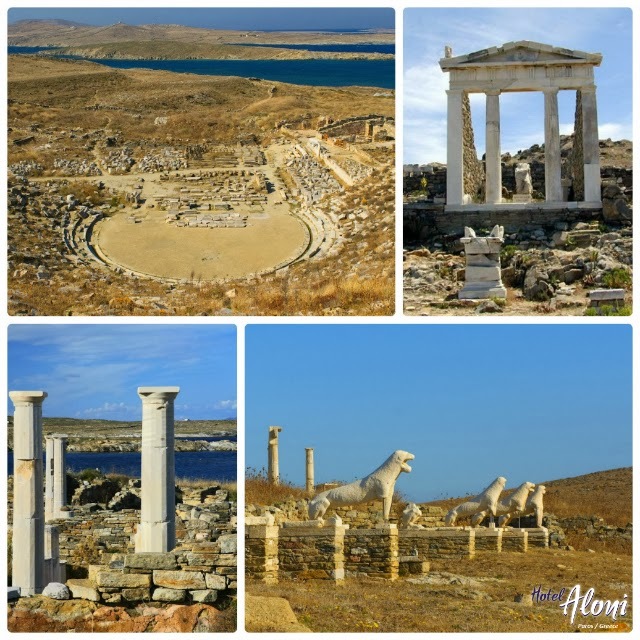 The archaeological experience is the one and only activity the island and it is much cheaper to arrange a guided tour before arriving on Delos. Enjoy a walking tour along the Sacred Way, admire the Agora and the Temple of Apollo. View the House of Dionysus, the House of Cleopatra, both of which feature great architecture and mosaic floors. These have survived for 2,500 years and even ambushes by pirates! Finish your walking tour with the spectacular Avenue of Lions. The majestic five Naxian marble beasts date back to the 8th Century BC. They stand as sleepless guardians of the Sacred Lake. For day trips to Delos, departures are from the Naoussa Port on Paros Island. A tour of the historic island only takes two hours and after exploring you can hop back on the boat and continue your mini cruise to Mykonos or back to Paros to relax and enjoy a beautiful sunset. You should definitely think of a mini day cruise to Delos Island. It only takes a few hours and you’ll come back feeling satisfied, as if you’ve travelled back through history and time.